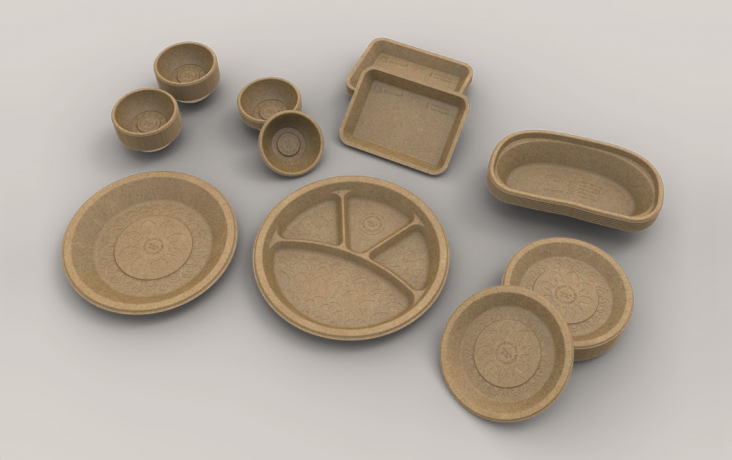 BIO-LUTIONS offers sustainable packaging and disposable tableware solutions made of agricultural residues. They convert their raw materials into self-binding natural fibres through a mechanical process. The raw materials do not have to go through the energy-intense process of cellulose extraction or bleaching. This way, BIO-LUTIONS avoids the excessive use of chemicals and water in their production processes, both common to cellulose based paper and bio-plastic production, as they state on their website. “Our technology makes it possible to use even the shortest fibres from most agricultural residues found worldwide. The goal is to create a decentralized production network with local factories and regionalized distribution. This will go hand in hand with localized raw material collection and processing.” By decentralizing the production, BIO-LUTIONS can meet local demand, create local jobs while also limiting CO2 emissions and transportation costs thanks to simplified logistics. BIO-LUTIONS – Advantage, Benefits, Process, USP, Portfolio and Raw Materials.